The 'bombirdier' goes live for everyone on Thursday. 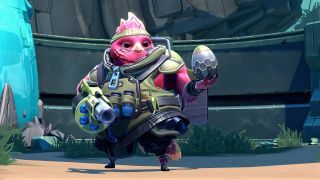 Battleborn has a new hero, and true to the game's design philosophy he's a zany anthropomorph supported by a bunch of eye-roll-worthy puns. I wouldn't have it any other way, of course, so let's all say hello to Ernest: a big pink hen in military garb. If you're a season pass or digital deluxe edition owner, Ernest will have made himself known to you a few days ago, but he'll fly home to roost for everyone else this coming Thursday.